Trees are wild things. Their branches grow out in all manner of odd ways that are a balance of supple sun seeking and stable strength stretching. 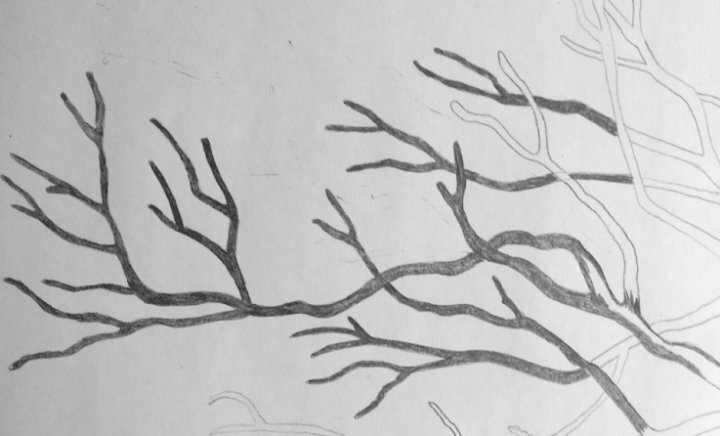 Drawing trees for art’s sake misses most of that wildness. It was only when I began to make drawings from pictures of the trees in my neighborhood that I began to realize just how inaccurate my original sketches, and ideas about trees, had been. I took my iPad on a walk through the neighborhood and started making nicely framed pictures of branches. That’s all I needed in this piece. Just branches. Not the whole tree. With wild, live trees as my inspiration, I began the first set of drawings. They’re beautiful! And unlike my previous drawings, which were made with both art and engineering in mind, the limbs don’t conform to gradual tapering as they branch out. And they crook and turn in the most illogical looking places. Branches cross in non-uniform ways and take on the darnedest shapes and lengths. For drawing aesthetics, each branch didn’t make any sense. But all together, they were perfect. After making two drawings, one for each layer of the piece, I placed them on my lightbox to see how they fit together. Everything made sense in the outline drawing because I could clearly see where each branch originated and which branches were forward and which were behind. But I wondered if all of it would make sense if those definitions of space were taken away. After all, I’ve been accustomed to carving all of that detail in. Because I’m using plywood, this time there would be no carving details. So I began coloring the outline in. It would look like one solid thing in the drawing, just as it would when cut in plywood. I gazed at my drawing anew. It did. It looked like seaweed if turned so the ends of the branches faced upward. If turned so they faced down, it looked like lightning bolts. Only when it’s turned to face inward does it look like tree branches. No matter what I end up naming this piece, I think I’ll forever refer to it as seaweed trees.